A strong second album from the dream pop trio that carries on the sound of its predecessor: beautiful and expansive melodies with a minimal amount of guitars, keys, and drum machine around them. 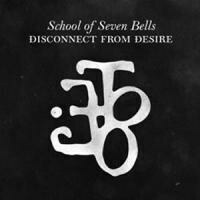 School of Seven Bells writes relatively simple songs. However, where another band might scale down in the name of simplicity, this band goes expansive. On the new album, like on the debut, Alpinisms, it’s all about melody. Each song finds its basis in a catchy and pretty melody, sung and harmonized by the twin sisters, Claudia and Alejandra Deheza. Around the voices comes sequencing, jangling guitars and synthesizers. The songs don’t have much texture: just vocals and what amounts to a backing track (the music never really grabs your notice separately). They also don't have many parts to them besides a catchy verse and a catchy chorus and sometimes a wordless melodic part. Still, even with these few layers, School of Seven Bells manages to pull off a big sound. Though there is synthetic feel to the album, it still conveys a sense of majesty that comes across naturally, as if you can hear the room too -- or, as if the band was performing on a mountaintop. It's not a loud sound, though. There's a clear shoegazer aesthetic in the music as the songs build and soar, curl upon themselves but always with more intensity. Yet, in no way does the production resemble that of most shoegaze albums. The vocals stay clearly above the music. Everything is clean and crisp, with an '80s synth-pop sheen rather than a '90s feedback squall. But even though the vocals carry most of the musical duty, they don't come across in the typical style of a "lead". Like with shoegaze, the voice is treated as an instrument in itself. And therefore, the lyrics take a backseat. The words are rhythmical markers, without too much interest in themselves. The songs all seem to revolve around a cryptic or abstract scenario that goes well with the impersonal style of this band. The singers are twins, and blend their voices in harmony; nothing seems too individual. Though the band is American (formed from members of the Secret Machines and On! Air! Library! ), it has a distinctly British -- or perhaps Celtic -- sound. The melodies call to mind British and Irish folk music; not only due to the timbre of the Deheza twins' voices, which both have the serenity of passing on a kind of collective experience, but also in the intervals of the notes they sing and the easiness with which the songs become part of your memory. This is a testament to the skill of the band's songwriting. It is a risk to keep the sound so simple, but School of Seven Bells can rely on a catchy mastery. Because School of Seven Bells is no longer a new band, the album can't rely on the novelty of its sound. And unlike Alpinisms, Disconnect from Desire doesn't immediately win you over. It grows on you. The album opener, "Windstorm", makes a strong impression with its infectious repetition and its simple beauty. But the album stretches this immediate display of power into more serene songs and only reaches a similar height in the middle with the strange sweetness of the back to back "Babelonia" and "Joviann". The new album loses some of the rhythmic interest of its predecessor and at times the drum machine leaves something to be desired, or at least allows a kind of crack in the majesty of the sound. There are some silly fills ("Dust Devil") that date the band's influences clearly in the '80s and almost seem like parodies. Again, a risky move, but one that is saved by the way the songs build an enormity around these pieces, rather than crumbling into cheese. So, while the freshness is lost -- the band hasn't taken any grand steps in developing their style and it hasn't done any real experimenting -- the songwriting is still very good. The happiness of the album is catching like the cheer of a sunrise. You might be grumpy and unwilling at first, but the warmth and light finally convinces you everything will be okay.